Last week we had a last supper for our friend Dani, who was about to move back to America. Our hearts were broken, so we decided to go out and eat and drink together –– an activity of central importance in our friendship. Dani’s friend Tait had told her that the one restaurant she had to visit in London before departure was St John. Well, they were full, but we went to it’s sibling, St John Bread and Wine – and there’s nowhere I’d rather break bread and put away several bottles of house wine with those closest to me. We drank too much wine and got messy picking out the meat and sucking the saline juices from the limbs of the Cornish crab. On the table next to use there was a bird-like man in his late fifties, dressed in black, resembling an artist, and a young Japanese woman, around early twenties, also dressed in black. They sat in silence while the man consumed a chocolate mousse, then left: a fine example of eccentricity, perhaps also a goodbye token of England (or rather, London) for Dani. Everything was wonderful, with one minor gripe from me that the pig’s skin could have been crisper and hotter. The mutton was served rare, which I had not eaten before, but it was very good: flavourful, which one would expect from an older sheep, but not excessively so. The garlicky green sauce with the goat’s curd on toast was a favourite too, but the collapsingly soft fennel served whole with the mutton made the biggest impression on me. On Friday night of the same week, I cooked this meal pictured above for my old friend Lily, proprietor of Café Viva in Peckham, which incorporated elements from the St John B & W meal, in a new configuration. I did not know how they cooked the fennel that I had with the mutton, so made up this method, which worked well. Lily said that the fennel, goat’s curd and walnut were made for each other and this method leaves the fennel very soft. Pre-heat the oven to 180 degrees celsius. Into salted, boiling water, drop the halved fennel bulbs and boil for 2-3 minutes. Drain. In a small oven dish, lay out the fennel bulbs. Season with salt and pepper and place a blob of unsalted butter on each. Seal the oven dish off with tin foil so that there are no holes. Place the fennel in the oven. Cook at 180 for 30 minutes, then turn down to 150 for 1 hour. Prepare the salad by washing the lettuce and whisking the dressing ingredients together. Remove the foil and caramelise the fennel for 5-8 minutes, until browning slightly, under a hot grill. 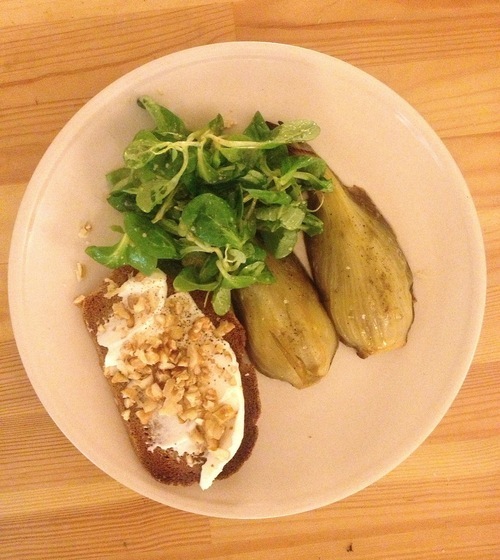 Make the toast, spread a generous amount of goat’s curd over it and sprinkle with walnuts. Serve a slice of toast alongside two fennel halves and a small heap of dressed lettuce.